Some things in life are truly frustrating… Having to use Internet Explorer on a public PC, being without an e-mail client that has all my settings already saved — you get the idea, but what’s the solution? Actually, I think I’ve just found it, and all you need is a USB memory stick! In case you hadn’t already guessed, I’m talking about the PortableApps platform, which is a completely free download, and allows you to install portable versions of many applications on your USB pen drive so that you can take them with you, and can use them on any PC. When downloading PortableApps, you have three packages to choose from: “Platform Only”, “Suite Light” and “Suite Standard”. If you choose to download the “Platform Only”, you won’t get any of the bundled applications that come with the other options, only the PortableApps platform itself. Which option you choose to download is up to you, although if you have a large enough USB flash drive, it may be easier to get the standard package and then simply remove what you don’t need. The “Platform Only” weighs in at just 1mb. If you choose the “Suite Light”, you’ll need 150mb of space on your drive, and 355mb for the “Standard Suite”, which includes OpenOffice amongst other things. When installing PortableApps, be sure to install it to your flash drive and not your local hard drive. This may seem obvious, but installing a program into the “C: drive” directory becomes second nature after a while! How long installation takes will depend on the package you chose, but it shouldn’t take too long to be up and running. 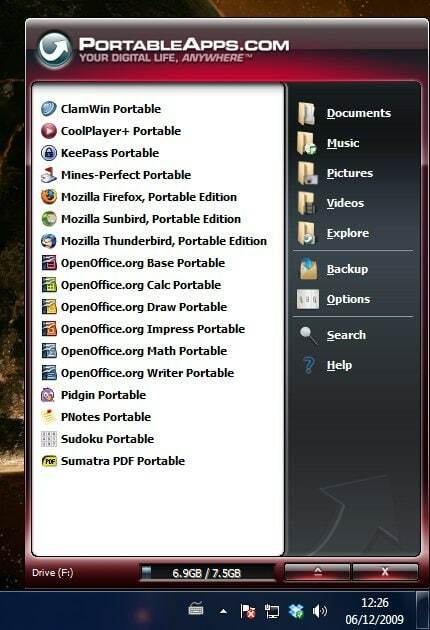 When you’ve completed the installation, you can open PortableApps for the first time, and depending on what version you downloaded, see all your applications. The layout of the menu is similar to the Windows start menu, with a list of all your installed applications taking centre stage and links to your documents, music, pictures and videos to the right. When getting used to how everything works, I was very impressed at how easy it is to install and remove applications from your drive. All of your portable applications are stored in the “PortableApps” directory of wherever you installed the application, where you can simply delete an application’s folder to completely delete it. When installing a new application, you can download an installer from the PortableApps website which will install the program into the correct directory. Next time you open up the menu, your new application is waiting to be used. I was pleasantly surprised to see how easy it is to remove and add different applications to your drive, and it definitely makes the whole experience a lot easier! I decided to use my portable applications on three machines, two of which were running Windows 7 and the third was running Windows XP. 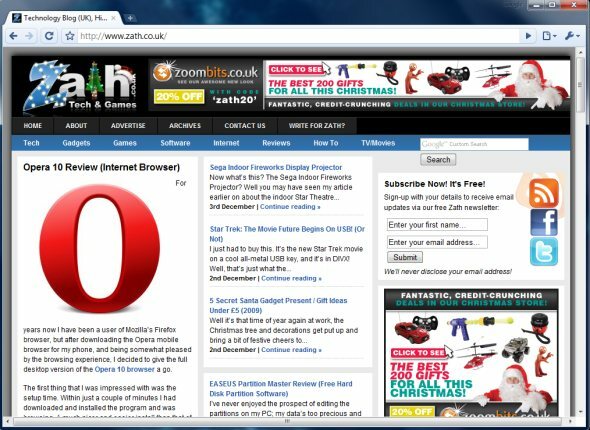 On every test, all my settings were taken over from my previous setup which meant that I could open Thunderbird and my account was already set up, and my most popular sites were still intact on Chrome and Firefox. I couldn’t tell the portable applications apart from the full versions of the applications when using them — Firefox and Thunderbird look and perform just like they would if they were running off my hard drive, and I was particularly impressed with the speed of OpenOffice when using the suite of applications. If you’re looking to take your applications on the road with you, PortableApps.com is most definitely the way to go.